The roadside carnage we witness around our domicile upstate shows that outside of hunters (we need more of them, please), cars are the only real, if accidental, deer predators. But with an average property damage price ticket of $3,171 per deer collision, according to State Farm Insurance’s annual report on deer-vehicle collisions, this is an expensive — and dangerous — form of population control. Far from cute, Bambi and his emboldened brood are out of hand, be it on the road, in gardens or in sensitive woodland habitat. 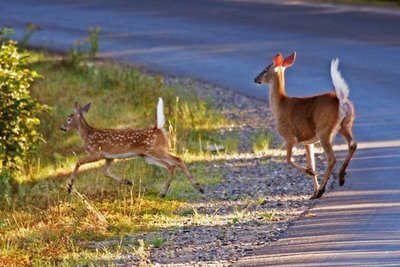 November, the apex of the deer mating and migration season, is the month when cars and deer are most likely to clash — more than 18% of such accidents happen in November, says State Farm, followed by October and December. There is good news. For the third consecutive year, the estimated number of deer-vehicle collisions in the U.S. has dropped. And the downturn is apparently accelerating. But the anecdotal evidence from our neck of the woods does not playback this positive trend. And as a three-time collider (in the last eight years), I find it difficult to believe, almost insulting, that New York State ranks 21st in terms of likelihood of a collision with deer within the next year, at 1 in 157. No doubt in my mind that Dutchess County by itself would rank near the top, along with #1 West Virginia (1/52.8), Iowa (1/77.2) and South Dakota (1/81.2). Of course, in raw numbers of accidents, New York State ranks 3rd (72,307), behind only Pennsylvania (101,299) and Michigan (78,304), but New York also has lots more registered drivers, which takes down the likelihood numbers. If a collision seems imminent, swerving to avoid could cause you to lose control of the car, and possibly send you into on-coming traffic. This entry was posted in At Our Farmhouse, Hudson Valley and tagged deer-vehicle collisions; State Farm Insurance, White-tailed deer. Bookmark the permalink. We also have deer problems in DC. A friend of mine came out of a restaurant (Founding Farmers) on Pennsylvania Avenue, about three blocks from the White House, and would have been struck by the buck running down the sidewalk toward her had it not been for her friend’s panicked yell. 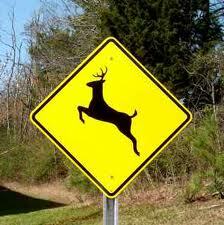 Does State Farm have a damage estimate for deer / human collisions? Do body shops charge more than dentists? Since you write about food, I should add that they loved their meal. However, perhaps the restaurant should put venison on the menu. We could help them build a camouflaged pit trap on the sidewalk. It would be interesting to see what kind of game we would catch – I suspect we would nab a few elephants and donkeys. I am hopeful that pigs would be scarce now that there are fewer pork barrels in DC (delusional comment). Sid, thanks for sharing. We, too, are continually amazed at how utterly fearless deer have become…whether it’s ravaging your vegetable garden, or, apparently, trotting down Pennsylvania Avenue!! What a great idea you have for local sourcing….and at no cost to the chef…”sidewalk-to-table” cooking!! By the way…we LOVE venison! !